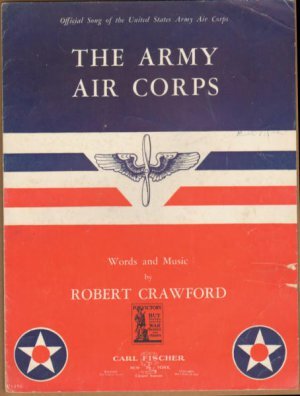 About the Army Air Corps Song This song was written in 1938 when the Army Air Corps decided that it needed a song. A contest was created with a $1000 prize, donated by Liberty Magazine. Over 700 compositions were submitted. In addition, Meredith Willson and Irving Berlin were asked to write entries as well. In the end, the prize went to Robert MacArthur Crawford, a music teacher, who had attempted to serve in World War I, but was kicked out after it was discovered he was underage. He enlisted again for World War II and flew for the Air Transport Command of the U.S. Army Air Forces. After the war, he joined the music faculty at the University of Miami. Nothing’ll stop The Army Air Corps! The Army Air Corps Song was recorded on October 21, 1957 and released in 1957 on the album The Beat of My Heart. It was arranged by Ralph Sharon.